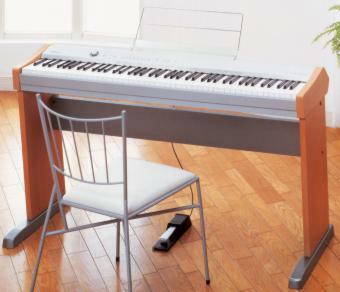 Casio launched its latest contribution to the digital piano market, the stylepiano PS-20, at Musikmesse Frankfurt 2002. The compact housing of the PS-20 is made of brushed aluminium with beech veneer and not only matches trendy living room style but also modern interior design of clubs, hotels or restaurants. The optional stand is detachable. Featuring ZPI (Zygotech Polynominal Interpolation) sound technology developed and patented by Casio, the PS-20 provides realistic acoustic piano sounds using digital processing of sampled tones. The 88-key hammer action keyboard sports a choice of three velocity levels. Eight different voices, from grand piano (1 or 2), bright piano to mellow and electric piano (1 and 2), to vibraphone and harpsichord can be used with eight reverb and eight chorus effects offer further variety. With its on-board stereo sound-system the Stylepiano can be played without using external amplification. MIDI In and Out provide connectivity to a computer based sequencer, another instrument or an external sound module. Further features of the Casio PS-20 are 64-note polyphony, metronome, transposer, headset and line outs, pedal connectors, and a real-time sequencer with a capacity of 2500 notes.